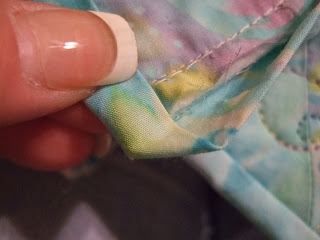 Turn the binding to the back and pin. 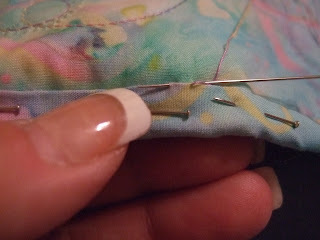 I usually use my small applique pins. I rarely get my thread caught in them. 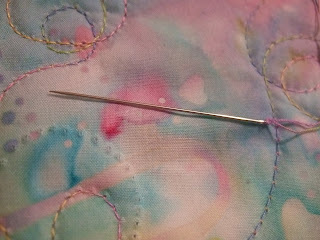 I pin about 10 or so and move them as I pass them by or when I rethread my needle. leaving just a small stitch. 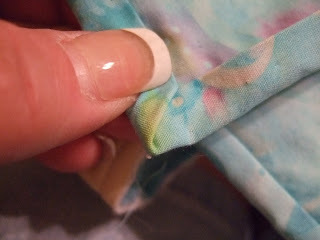 If I use a finer thread, sometimes it just disappears. 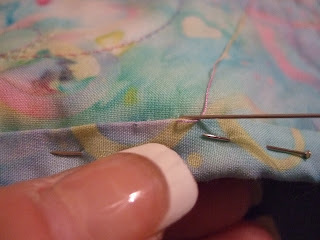 Silk thread is lovely! When you come to a corner...try it both ways. fold it out, leaving the 45 degree angle. Fold up the other side. now try it folding the side first. Now fold in the bottom. It always amazes me that one side ALWAYS folds in perfectly and lies flatter. If you are showing your quilt? Be sure to stitch down the miters on both sides. Judges DO look! On the only quilt I put in a show, I was in a hurry to get to the drop off place. 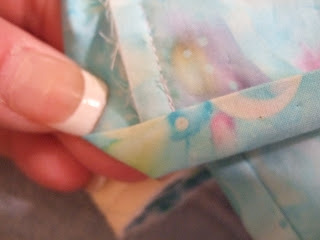 I had sewn all the miters on one side..but only ONE miter on the other. 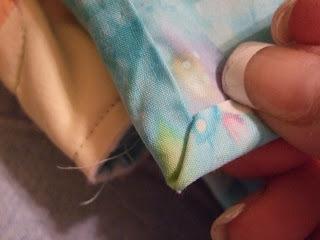 I got a comment saying "miter corners sewn down" GEE I bit THAT bullet didn't I???? Great pics and thanks for sharing! 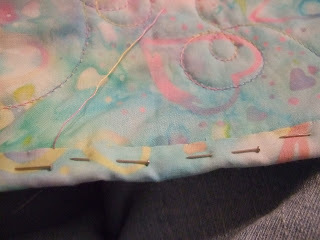 I also sew my binding down this way, but some other ladies in my Guild do a sort of whip stitch. I prefer this way! 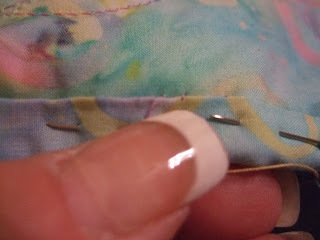 I invariably scratch myself or lose the pins. I use 3 Micro Binder Clips so when I get to the first one I move it behind the last one. Works great for me. Thanks for the tutorial! I didn't know that those corners could be folder either directions. I'll give it a try. Your nails look so nice! Did you get them done just for your pictures or do you always keep your hands looking so nice? Thanks for the great tutorial. That is how I tend to do my bindings... I did not know about the corner folding the other way.. I'll have to try that! Thanks!!! Wish I had seen this BEFORE I did my binding. Might have saved me a lot of time. I went to youtube to find a 'video' of the blind stitch believe it or not! Great job on the tutorial, Beth! The only thing I would suggest is using hair clips instead of all those pins. Only need about 5 of them to control about a foot of it at a time--works for me! I am sending this to my quilt group as they may benefit from the pictures that you show along with the narrative. One I know feels like she has problems with her corners. THX! Great binding tutorial. I am so glad you posted this as it was one of the techniques that needs more attention. 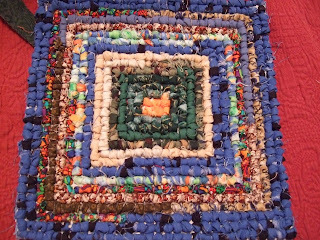 I am emailing this link to my quilting group, they will love it!